The leader of Scotland’s Independence Referendum Party (www.SIRP.Scot) has lodged an official complaint with the chief constable of the Metropolitan Police Service in London against a hate-crime by (Alexander) Boris Johnson, MP, the British foreign affairs minister. Johnson’s crime was committed when he described black people as ‘piccaninnies’ in a keynote public speech earlier this year in London. 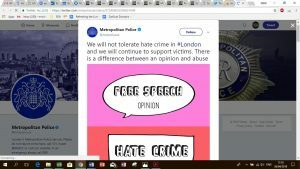 “I have written directly to the Metropolitan Police Service to register, and thereby, complain about, a prima facie ‘race hate’ crime committed by A. (Boris) Johnson, MP. “Indeed, the fact that Johnson has) apologised for describing black people as piccaninnies is self-evidently probative of the completed crime. “However, an apology (however extenuating) does not extend to a defence in law – and simply corroborates the initial crime. “Please do not rush to a ‘… it would not be in the public interest’ get-out clause as an excuse for not taking action and investigating Johnson’s (already self-confessed) crime. “Similarly, there is no time-limit on criminal arrest and charge. A copy of this letter has been sent mutatis mutandis to Boris Johnson, Amber Rudd (British Home Office minister for policing, and Sadiq Khan, the mayor of London. This article is about the ethnic slur. For the mountain in California, see Pickaninny Buttes. For impact structure in Western Australia, see Piccaninny crater. Distinguish from Picatinny (a USA arms research base, and a type of fitting for guns). Pickaninny (also picaninny, piccaninny or pickinniny) is, in North American usage, a racial slur which refers to a depiction of dark-skinned children of African descent. It is a racist and derogatory caricature. It is a pidgin word form, which may be derived from the Portuguese pequenino (a diminutive version of the word pequeno, “little”). In modern sensibility, the term implies a caricature which can be used in a derogatory and racist sense. Scotland’s Independence Referendum Party is not competing with the SNP; rather, we want to work in a progressive alliance with them and other groups that support Scotland’s Independence.